‘Joyful sincerity’: Pete Kirwan writes on an earnest, escapist panto that brings the 12th century into the 21st. The Taron Egerton film may have just limped into the UK box office, but to all intents and purposes there’s only one Robin Hood in Nottingham this Christmas. Say what you will about the Hollywood versions, but far too few feature Nurse Nelly Noggins greeting the audience with an ‘Eh up mi duck’ or Robin and Marian meeting clandestinely at the twelfth-century pub Ye Olde Trippe to Jerusalem – here, just ‘the Trip to Jerusalem’. The Nottingham panto has been around for almost as long as the Robin Hood myth itself, and there’s pleasure in the ease and familiarity of its jokes. The plot is the slightest of pegs on which to hang the set piece (as slight as the painted hook on which Nurse Nelly fails to hang her dressing gown, in the show’s best visual gag), with Robin outlawed by the Sheriff of Nottingham (Oh No, Not The Sheriff of Nottingham!) and then rescuing the Sheriff’s niece and nephew, from whom the Sheriff wishes to steal their inheritance. We’re not here for the story, however, and Tim Frater (last year’s Buttons) is as much compère as leading man, with the emphasis on constant audience interplay and mutual affirmation, which the audience roar back in chorus. The merry men all have their stock joke – Will Scarlett keeps having to be disguised as a woman, Tilly the Tomboy reminds Robin that they are the Merry Men and Women, Tina Tuck keeps bursting into ‘Simply the Best’. Robin Kingsland’s snarling, moustachio-twirling Sheriff of Nottingham (Oh No, Not The Sheriff of Nottingham!) is a perfect villain, aided by the hapless Arnold, and milks the boos for all they’re worth. As ever, the highlight is John Elkington, still the best dame in the land. Kenneth Alan Taylor’s panto ethos is family-friendly, his programme note even expressing anger at pantos where jokes go over kids’ heads, and so the atmosphere is one of joyful sincerity. The privilege of Elkington’s Dame is to be the character who casts a gently mocking eye over everything, frequently making other cast members corpse as he adlibs, points out audience members who aren’t joining in (this year making one refusenik come up on stage to demonstrate the actions to ‘Radio Ga Ga’), and models his increasingly elaborate costumes. The singing and dancing is top-notch, with an unusually eclectic mix. I’ve got no idea how they got the rights to Hamilton’s ‘You’ll Be Back’, but sung to Maid Marian by the Sheriff of Nottingham (Oh No, Not The Sheriff of Nottingham! ), the song has an unusually sinister edge while also bringing down the house as it gets into the da da das. A Queen medley between Sheriff and Nurse develops into about twenty minutes of encores for ‘Radio Ga Ga’, but the showstopper is the (checks notes) ‘Baby Shark Dance’, which had a quite terrifyingly electric effect on the kids and parents in the audience. Between the songs and scraps of plot, the fabric of panto is all there and correct. Two great ‘It’s behind you’ sequences feature a naughty rat hiding in the flour and a particularly sneaky ghost; a super soaker chase through the audience removes any sense of safety; and the song sheet brings onstage an adorable bunch of moppets to lead the whole house in ‘Under the spreading chestnut tree’ with actions. The panto is a ritual with its own codes and practices, and a rapturous press night audience threw themselves into it. Taylor’s programme note doubles down on the troubles of the current world, asking its audience to forget its problems and ‘join us in a world where good always defeats the bad and everyone lives happily ever after’. The celebration of escapism may not be to all tastes, but amid the silly jokes and slow-motion escape sequences, there’s something more important happening. The pleasingly diverse cast represents the Nottingham of today rather than that of eight centuries ago, and the panto’s extraordinary ability to bring people together in song and celebration during divisive times can’t be dismissed. Robin Hood’s infectious rejection of cynicism is the most powerful arrow in its quiver. 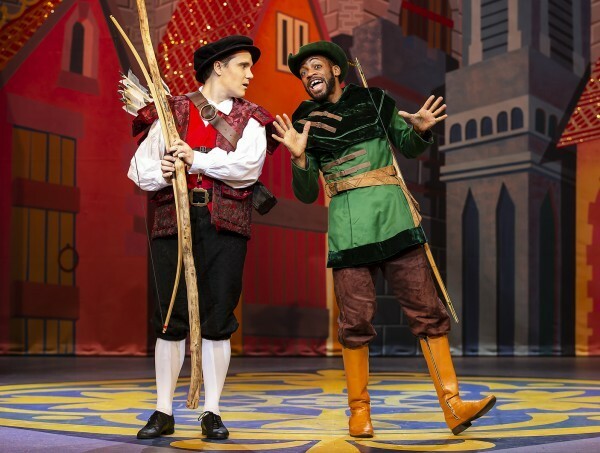 Robin Hood and the Babes in the Wood runs at Nottingham Playhouse until 19th January. More information here.